Why Is The Media Ignoring Saudi King's Praise Of Trump's Iran Strategy? Why Is The Media Ignoring Saudi King's Praise Of Trump's Iran Strategy? Why Is The Media Ignoring Saudi King’s Praise Of Trump’s Iran Strategy? Unlike the foreign press, left out of most U.S. media reports about the JCPOA when it was announced in 2015 was that Saudi Arabia objected to the deal as vehemently as Israel. Although eventually the kingdom publicly supported the deal, the Saudis still found ways to express their anger. After President Trump’s Iran speech Friday, Saudi Arabia was as effusive in its praise as the Jewish State, but again the press ignored the story, perhaps because it doesn’t fit their narrative about the Iran deal or Israel. a Saudi official said Iran’s nuclear deal with world powers on Tuesday will make the Middle East a “more dangerous part of the world” if it comes with too many concessions, signalling Gulf Arabs’ deep unease at the agreement. The lack of official responses from Saudi Arabia and its Gulf allies reflected huge nervousness about a deal set to end the pariah status of Iran, already Riyadh’s main rival for influence across the Middle East, and unchain its economy from crippling sanctions.One Saudi diplomat described the agreement as “extremely dangerous” and said it would give a green light to his own government to start a nuclear energy programme. The prince was less polite in an op-ed he wrote for the London-based Arabic news Web site Elaph. He compared the Iran nuclear deal made by Obama to the North Korean nuclear deal Bill Clinton made. Bandar suggested that they were both bad deals but Clinton made a bad deal with the best of intentions thinking it was a good deal. Obama, on the other hand, knew he was making a lousy deal and made it anyway. Bandar said Obama is smart enough to understand that it’s a bad deal but that he is ideologically willing to accept collateral damage because he believes he is right. 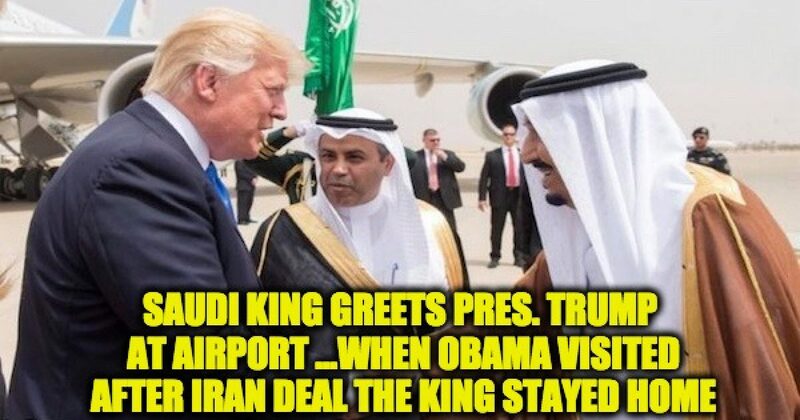 Perhaps the most public display of the Saudi Anger over the deal was when President Obama went to Saudi Arabia in 2016, he wasn’t greeted by the king at the airport, instead, the King sent a clear message of anger to the President by greeting him with a small, low-level delegation to greet the President, and unlike they have done with every other leader (including previous Obama visit) Obama’s arrival was not televised on state-run TV. Just as the Saudi anger over the Iran agreement was ignored, the Kingdom’s praise of President Trump’s new strategy is also being ignored. The Kingdom of Saudi Arabia welcomes and supports the resolute strategy announced by President Donald Trump, President of the United States of America with regards to addressing Iran and its malign behavior. The Kingdom commends the President’s clear-eyed vision, and his commitment to working with the United States’ allies in the region to confront common threats, especially those posed by Iran’s aggressive policies and behavior in the region. Custodian of the Two Holy Mosques King Salman bin Abdulaziz Al Saud held a telephone conversation yesterday evening with President Donald Trump, President of the United States of America, in which he affirmed the Kingdom’s support for and welcomed of the firm strategy announced by the president towards Iran, its aggressive activities and support for terrorism in the region and the world. The king praised the leadership role of the new US administration, which recognizes the magnitude of these challenges and threats, stressing the need for concerted efforts and taking firm positions on terrorism and extremism and its first sponsor, Iran. President Trump expressed his appreciation for the initiative of the Custodian of the Two Holy Mosques and his support and stressed the keenness of the United States of America to work with its allies to achieve world security and peace. The Kingdom of Bahrain was also very pleased with the President’s new Iran policy. Another rationale may be that as a tool of the liberals, the mainstream American media is strongly biased against Israel. And just like the Democratic party, they see Israel as an aggressor with no interest in peace. By concentrating on Israel even though there are other neighbors of Iran who believe the JCPOA does little to stunt the Iranian nuclear desires, the MSM is supporting the liberal picture of Israel. Either way, they are misleading the American people.